It’s 1225 BC, and one of the mightiest pharaohs of them all, Ramesses II, rules a land that is both powerful and wealthy. Egypt is stunningly beautiful with a pleasant climate year-round, and if that alone isn’t a big enough draw for the time-traveler, the fruits of Egyptian civilization are plentiful and worthy of contemplation. Pyramids and temples to the gods abound, and colossal statues of Egypt’s divine rulers are seemingly everywhere. The Egyptians, however, are not particularly fond of foreigners, and just getting to Egypt can be arduous. Here is the inside scoop on how to enter and travel through Egypt, conform to its customs and expectations, and appreciate its often mysterious culture. You’ll travel the Nile from north to south, stopping at such intriguing places as Memphis, Akhetaten, Abydos, and Thebes, where Egypt’s grand past and present unfold before you. 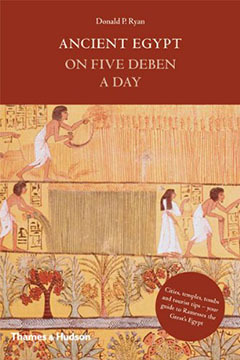 Egypt has long been a subject of broad popular interest, and this book provides an enjoyable glimpse of the ancient empire and its industrious people. Plenty of fascinating advice for the traveler in ancient Egypt… Foreigners might be bewildered by animal-headed deities and what appear to be numerous contradictions in Egyptian theology. Not to worry! There’s a system behind it; Don’t bring up the topic of the renegade pharaoh, Akhenaten, among new acquaintances. Many wish he hadn’t existed; Should you need to visit an Egyptian physician, there’s a good chance he’ll prescribe a purge of one sort or another, accompanied by a magic spell. You’ll need this guide on your next trip to ancient Egypt! Color Sections. Imported from Britain. Published at $1800, our price only $14.95.